Before diversifying into country/blues rock in the early seventies, Link Wray was one of the most influential rock 'n' roll guitar instrumentalists. His work was superb, combining rock 'n roll with the blues, rockabilly and all sorts of personal innovations too. He was the Jimi Hendrix of the late fifties/ early sixties but is nowhere near as credited. Obviously, because of the early date of some of the recordings, the sound early on its a bit patchy and the first couple of tracks a bit dated, but when you hear the first notes of "Rumble" you think "hold on - what's this? Late fifties - are you kidding?" It is truly awesome, as indeed is "The Swag" and "Raw-Hide". Listen to "Comanche". Yes we had The Shadows in the UK at the time and yes, they were hugely inventive and influential, but they had nothing on this. This is proper electric guitar rock - packed full of searing licks, a bit of distortion and power. The bass and drum backing is similarly pulsating too. Even when he slows the pack down a bit, on the gently romantic "Lillian" the rhythm are infectious and the guitar work sublime. Check out that huge rumbling bluesy bass on "Night Life". 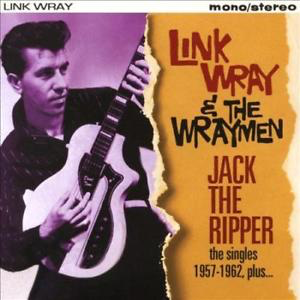 Link Wray took what were by now conventional rock 'n' roll rhythms and turned them into something else - something darker, rocker, bluesier, tuneful but somehow a bit menacing too, in places. "Slow Drag" is like The Shadows on acid. It blows them out of the water. Superb bass on it as well as Wray's guitar. Pounding drums. The title track is deliciously mysterious. Fairground music for the brooding. I could go on about each track but I'm sure you get the picture by now. Top stuff. It is incredible to think that The Beatles' first album, with its simple backing and rudimentary feel, was said to have changed the world, yet music like this had been out there for a few years. This is so far ahead of "Please Please Me" it's remarkable.